Topic says it all. I keep seeing "Fish Scale" coins on ebay and other sites. They cover a variety of nationalities, denominations and dates. Is it some sort of variety or error? Don't be waylaid by the empty rhetoric of the uninformed. Usually "fishcsales" refer to the small 5 cent silvers pre-1920, especially Newf coins. I would imagine that some sellers also put that moniker onto any small silver coin, such as were prevalent in Central & So America pre-WW1. Seems like people are applying it to all small silver coins. 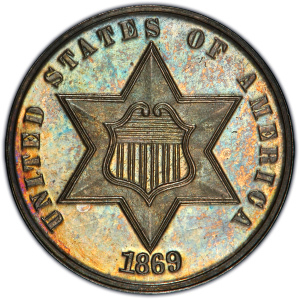 Ron Guth: The United States Three Cents is an unusual denomination that first appeared in 1851, although pattern coins for the denomination were produced in 1849 and 1850. The original purpose of the Three Cents coins to provide an intermediate denomination between the Cent and Half Dime, making it easier to change some of the odd foreign coins that were legal tender in America at that time. In 1851, postal rates were dropped from five to three cents. While three Large Cents could have been used to purchase a postage stamp, the bulky copper coins were expensive to produce. Thus, a coin of three cents value had two purposes, enough to get the denomination started in 1851. The first Three Cents were made of a low-grade silver. These tiny coins were known officially as "Trimes" and unofficially as "fish scales." They were the first circulating U.S. coin without a depiction of Miss Liberty in some form or other. In 1854, the percentage of silver in the coins was increased to 90%, to match that of the other silver coins in production at the time. Three sub-types exist of the silver Three Cents. Type 1, issued from 1851 to 1853, shows the obverse star with a single outline. After 1853, the weight of the Three Cents coin was reduced. To indicate this change, two extra outlines were added to the star, resulting in the Type 2 version that lasted until 1858. In 1859, one of the extra outlines was dropped, creating the third and final sub-type, the Type 3 version.